Picking a new paddle board can get a little confusing at times. There are so many options for so many things. We are going to break it down here to only the best stand up paddle boards for lake use. We will start will the least expensive and work our way up. Breakdown: This has got to be one of your best bangs for the buck. Now I personally own one of these and this is my go to board when the family is just going to head out to the lake for the day and people want to have fun. I don’t have to worry about this board because it doesn’t cost much and can take a real beating! Wavestorm is know to sell their paddle boards at Costco as well, so if you see the setup there, just know it is a solid purchase. Whenever they offer these through amazon, they sell out fast and people are always asking me where to get more. Currently I see there are 10 left available through the link below (that adjusts as inventory comes in), but I am working on a deal with the company. Until that goes through, the best place is try any links I post here or head to your local Costco. If I find more places, I’ll let you know. One of the safest buys you can make in my opinion. Breakdown: If you are new to the sport of SUPing and you would like an all around inflatable paddle board that won’t break the bank, the iRocker is a smart buy. To get a quality iSUP for under $500 is a deal. You might at first think an inflatable board is just going to easily bend or be cheap, but with todays technology and construction, this is not the case. Once inflated to 14-15PSI it’s amazingly sturdy for the length of the board. Sometimes you will see pictures of these between two chairs and someone standing on one in the middle without it bending. I’m still amazed they can do that. 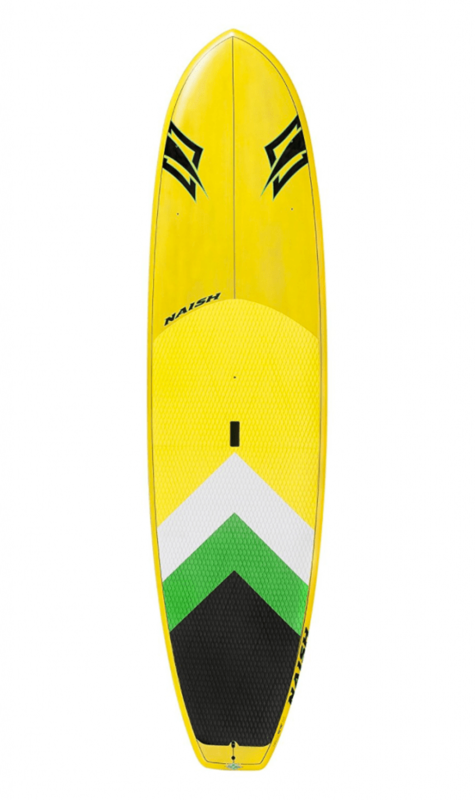 I would mention that I wouldn’t take this board out in super choppy conditions or higher winds as it is fuller and lighter so easier to blow around. It is however great for cruising around an open bay or your favorite lake. 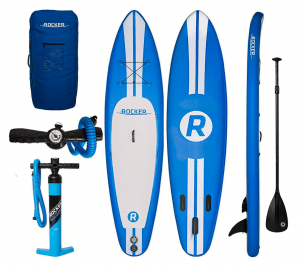 The iRockers comes complete with board, paddle, pump with gauge, and a backpack to help transport it around in or pack it up to a remote lake. The rating on Amazon speak for themselves, this has a high rating and a fair price for an inflatable. Breakdown: If you can afford a little more on a board then you will definitely get a good product when it comes to this Tower board. Not only can it handle a little extra weight, but it is also extra durable. 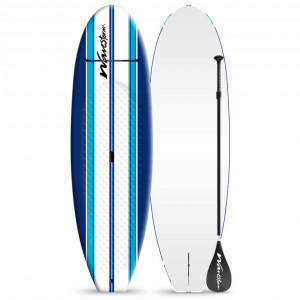 Priced at under $700 it is still on the affordable end of quality SUP prices for inflatables. What makes it extra durable is the high quality military-grade PVC they make it from and I might mention that is comes with a 2 year warranty from the manufacturer. That is a nice added bonus. Amazingly it can handle up to 350lbs which is incredible for an iSUP or even paddle board for that matter. Comes complete with board, paddle and air pump. I have to say I also like the simple colors as well. This Board is great for all skill levels and again, has one of the highest ratings for customer reviews for a reason. Great, great board. Breakdown: This is where quality meets quality. You have some of the best materials, a great board shaper, and fast yet controllable on the open water. This is a longer board (11’0″ or longer)which is why it is a little more stable in open water. Staying on top of this board really shouldn’t be an issue. Because it is fiberglass, it will be stiffer and faster on the water which is nice on a big open lake. You also won’t get blown around as easily because it is thinner than an inflatable and has a little more weight to it. 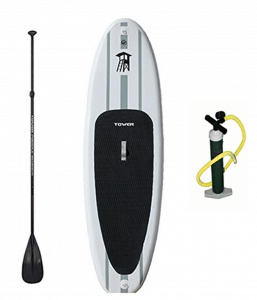 Because of it’s size, you can also try tandem paddling with this board. I would almost just quote the old adage, you get what you pay for and you get about everything great with this board. It also just looks cool, at least to me it does. 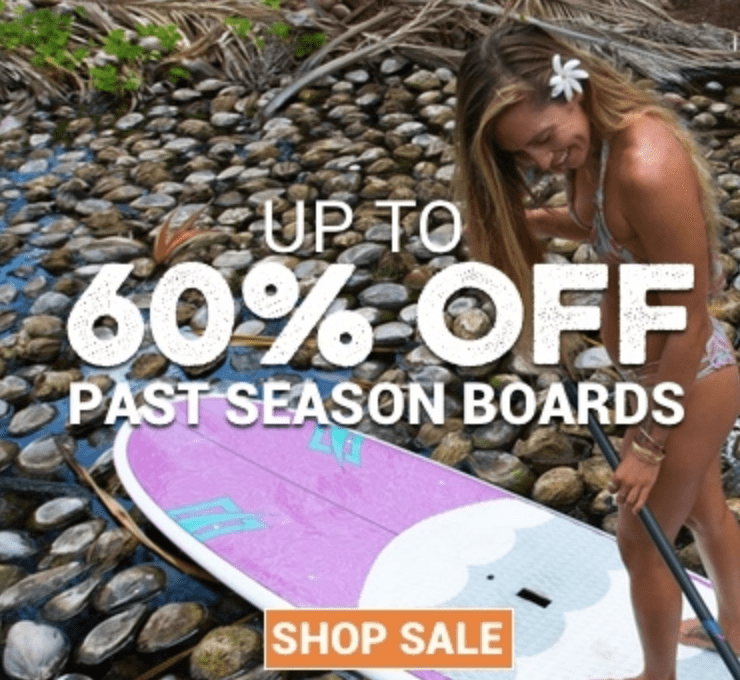 If you are not scared of money and want one of the best boards for lakes and open water, here you go! How do you feel about the Adventurer 2 ? Hi Pat, you mean this one: http://amzn.to/2vmfhmW? to me this is an optional upgrade to the “adventure” that we reviewed here. It is just a little longer so it has more board volume to handle a little extra weight. It also has the added cargo net for storage or holding a flotation device which is nice. Tower is such a great company, you really can’t go wrong with either one. The adventure is just a touch less $$$ so they both have great points. It really comes down to your personal preference.